Involuntary cardiac pumping supplies oxygen and nutrients into coronary and peripheral arteries, which has been recognized as main dynamics of body. 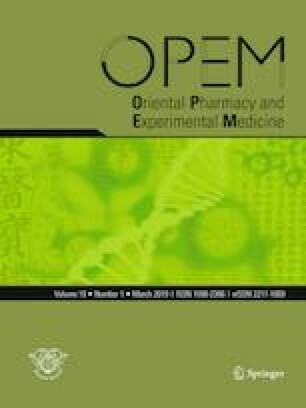 Among the molecules regarding cardiac dynamics, we aimed to investigate whether oxidative stress would induce the production of the exercise hormone and its levels could be regulated by herbal medicine, which represents “Heart Governs Vessels.” We searched MEDLINE for exercise hormone and screened titles and abstracts. The primary human myocardial, coronary arterial and peripheral cell lines were treated with hydrogen peroxide to mimic oxidative stress condition. Activity of irisin, an exercise hormone, was measured by ELISA assay. Expression of NADPH oxidase 2, an irisin’s putative target, was determined by immunoblot assay. Among the cardiovascular effects, we found that left ventricular systolic functions could be affected by several molecules, including irisin. In primary myocardial, coronary arterial and peripheral cell lines, irisin secretion and NADPH oxidase 2 expression was increased by 75 µM hydrogen peroxide. Interestingly, ChungliJagam-tang inhibited NOX2 activities by 31.45%, 42.62%, and 47.22% in an oxidative stress-induced primary myocardial, coronary arterial and peripheral cell lines, respectively. In conclusion, the changes in NOX2 level under an oxidative stress condition which mimicked left ventricular functions are associated with cardiac irisin activities and they were controlled by the herbal prescription on “Heart Governs Vessels”. Ho-Sung Lee and Seung Hoon Lee have contributed equally to this work. The study was funded by Korea Institute of Oriental Medicine (KIOM, Grant # K18891). This manuscript described has not been published before; not under consideration for publication anywhere else; and has been approved by all co-author.